HEN Bill woke next morning it was ten o’clock; and his first emotion, on a day that was to be crowded with emotions of various kinds, was one of shame. The desire to do the fitting thing is innate in man, and it struck Bill, as he hurried through his toilet, that he must be a shallow, coarse-fibred sort of person, lacking in the finer feelings, not to have passed a sleepless night. There was something revolting in the thought that, in circumstances which would have made sleep an impossibility for most men, he had slept like a log. He did not do himself the justice to recollect that he had had a singularly strenuous day, and that it is Nature’s business, which she performs quietly and unromantically, to send sleep to tired men regardless of their private feelings; and it was in a mood of dissatisfaction with the quality of his soul that he left his room. He had a general feeling that he was not much of a chap, and that when he died—which he trusted would be shortly—the world would be well rid of him. He felt humble and depressed and hopeless. Elizabeth met him in the passage. At the age of eleven or thereabout women acquire a poise and an ability to handle difficult situations which a man, if he is lucky, manages to achieve somewhere in the later seventies. Except for a pallor strange to her face and a drawn look about her eyes, there was nothing to show that all was not for the best with Elizabeth in a best of all possible worlds. If she did not look jaunty, she at least looked composed. She greeted Bill with a smile. The words had the effect of lending an additional clarity and firmness of outline to the picture of himself which Bill had already drawn in his mind—of a soulless creature sunk in hoggish slumber. Bill protested. He might be capable of sleep, but he was not going to sink to food. “Not for me, thanks,” he said, hollowly. He followed her meekly. How grimly practical women were! They let nothing interfere with the essentials of life. It seemed all wrong. Nevertheless, he breakfasted well and gratefully, Elizabeth watching him in silence across the table. She hesitated for a moment. A bee had flown in through the open window. She followed it with her eye as it blundered about the room. It flew out again into the sunshine. She turned to Bill again. “They were supposed to be words of consolation,” she said. “Let me tell you about Nutty first. I said that he had always been anxious that I should marry you. Something happened last night to increase his anxiety. I have often wondered how he managed to get enough money to enable him to spend three days in New York, and last night he told me. He came in just after I had got back to the house after leaving you and that girl, and he was very scared. It seems that when the letter from the London lawyer came telling him that he had been left a hundred dollars, he got the idea of raising money on the strength of it. You know Nutty by this time, so you won’t be surprised at the way he went about it. He borrowed a hundred dollars from the man at the chemist’s on the security of that letter, and then—I suppose it seemed so easy that it struck him as a pity to let the opportunity slip—he did the same thing with four other tradesmen. Nutty’s so odd that I don’t know even now whether it ever occurred to him that he was obtaining money under false pretences; but the poor tradesmen hadn’t any doubt about it at all. They compared notes and found what had happened, and last night, while we were in the woods, one of them came here and called Nutty a good many names and threatened him with imprisonment. She broke off and began to drum her fingers on the table. And as she did so there came to Bill a sudden relief from all the doubts and black thoughts that had tortured him. Elizabeth was straight. Whatever appearances might seem to suggest, nothing could convince him that she was playing an underhand game. It was as if something evil had gone out of him. He felt lighter, cleaner. He could breathe. “Yes. It’s going to hurt. You don’t know how it’s going to hurt, Bill; but it’s the only thing to do. I love you too much to live with you for the rest of my life wondering all the time whether you still believed or whether the weight of the evidence had crushed out that tiny little spark of intuition which is all that makes you believe me now. You could never know the truth for certain, you see—that’s the horror of it; and sometimes you would be able to make yourself believe, but more often, in spite of all you could do, you would doubt. It would poison both our lives. Little things would happen, insignificant in themselves, which would become tremendously important just because they added a little bit more to the doubt which you would never be able to get rid of. She broke off and looked at the clock. He gave a rueful laugh. He made an impatient gesture. He shrugged his shoulders helplessly. He followed her to his rooms, pulled out his suit-case, the symbol of the end of all things, watched her as she flitted about, the sun shining on her hair as she passed and repassed the window. She was picking things up, folding them, packing them. Bill looked on with an aching sense of desolation. It was all so friendly, so intimate, so exactly as it would have been if she were his wife. It seemed to him needlessly cruel that she should be playing on this note of domesticity at the moment when she was barring for ever the door between him and happiness. He rebelled helplessly against the attitude she had taken. He had not thought it all out, as she had done. It was folly, insanity, ruining their two lives like this for a scruple. Once again he was to encounter that practical strain in the feminine mind which jars upon a man in trouble. She was holding something in her hand and looking at it with concern. He had the feeling of having been hit by something. A man has not a woman’s gift of being able to transfer his mind at will from sorrow to socks. Bill’s voice broke. He felt himself trembling. She was kneeling on the floor, her head bent over the suit-case. She looked up and met his eyes. The sense of the nearness of the end broke down the numbness which held him. She was silent for a moment. He had moved a step toward her. He drew back, chilled. “I can’t do more than tell you,” he said. “Why? Look at it as I should look at it later on, when whatever it is inside me that tells me it’s ridiculous now had died. Just at this moment, while we’re talking here, there’s something stronger than reason which tells me you really do love me. But can’t you understand that that won’t last? It’s like a candle burning on a rock with the tide coming up all round it. It’s burning brightly enough now, and we can see the truth by the light of it. But the tide will put it out, and then we shall have nothing left to see by. There’s a great black sea of suspicion and doubt creeping up to swamp the little spark of intuition inside us. He started to speak; then, borne down by the hopelessness of it, stopped. Elizabeth stood up. They did not look at each other. He strapped the suit-case and picked it up. The end of all things was at hand. They walked in silence down the drive. The air was heavy with the torpor of late summer. They reached the gate. He took her hand dully. Elizabeth stood at the gate, watching. He swung down the road with long strides. At the bend he turned and for a moment stood there, as if waiting for her to make some sign. Then he fell into his stride again and was gone. Elizabeth leaned on the gate. Her face was twisted, and she clutched the warm wood as if it gave her strength. The grounds were very empty. The spirit of loneliness brooded on them. Elizabeth walked slowly back to the house. Nutty was coming toward her from the orchard. He was cheerful and debonair. His little eyes were alight with contentment. He hummed a tune. Nutty’s tune failed in the middle of a bar. Something in his sister’s voice startled him. The glow of contentment gave way to a look of alarm. They had reached the house before he spoke again. The world stood still. The noise of the crickets and all the little sounds of summer smote on Nutty’s ear in one discordant shriek. “Oh, gosh!” he exclaimed, faintly, and collapsed on the front steps like a jelly-fish. The spectacle of Nutty in his anguish did not touch Elizabeth. Normally a kind-hearted girl, she was not in the least sorry for him. She had even taken a bitter pleasure and found a momentary relief in loosing the thunderbolt which had smitten him down. Even if it has to manufacture it, misery loves company. She watched Nutty with a cold and uninterested eye as he opened his mouth feebly, shut it again and reopened it; and then when it became apparent that these manœuvres were about to result in speech, she left him and walked quickly down the drive again. She had the feeling that if Nutty were to begin to ask her questions—and he had the aspect of one who is about to ask a thousand—she would break down. She wanted solitude and movement, so she left Nutty sitting and started for the gate. Presently she would go and do things among the beehives; and after that, if that brought no solace, she would go in and turn the house upside down and get dusty and tired. Anything to occupy herself. Reaction had set in. She had known it would come, and had made ready to fight against it, but she had under-estimated the strength of the enemy. It seemed to her, in those first minutes, that she had done a mad thing; that all those arguments which she had used were far-fetched and ridiculous. It was useless to tell herself that she had thought the whole thing out clearly and had taken the only course that could have been taken. With Bill’s departure the power to face the situation steadily had left her. All she could think of was that she loved him and that she had sent him away. Why had he listened to her? Why hadn’t he taken her in his arms and told her not to be a little fool? Why did men ever listen to women? If he had really loved her, would he have gone away? She tormented herself with this last question for a while. She was still tormenting herself with it when a melancholy voice broke in on her meditations. Elizabeth clenched her teeth. She was not in the mood for Nutty. “It will gradually sink in,” she said, unsympathetically. A light shone on Nutty’s darkness. Elizabeth’s strained patience reached the limit. Nutty looked at her face, and decided not to make it worse. But his anguish demanded some outlet. He found it in soliloquy. Elizabeth had been trying not to listen to him, but without success. “Awfully good of you,” said Nutty, but his voice sounded almost disappointed. He was in the frame of mind which resents alleviation of its gloom. He would have preferred at that moment to be allowed to round off the picture of the future which he was constructing in his mind with a reel or two showing himself brooding in a cell. After all, what difference did it make to a man of spacious tastes whether he languished for the rest of his life in a jail or on a farm in the country? Jail, indeed, was almost preferable. You knew where you were when you were in prison. They didn’t spring things on you. Whereas life on a farm was nothing but one long succession of things sprung on you. Now that Lord Dawlish had gone, he supposed that Elizabeth would make him help her with the bees again. At this thought he groaned aloud. 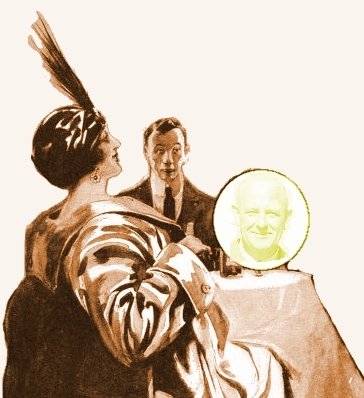 When he contemplated a lifetime at Flack’s, a lifetime of bee-dodging and carpet-beating and water-lugging, and reflected that, but for a few innocent words—words spoken, mark you, in a pure spirit of kindliness and brotherly love with the object of putting a bit of optimistic pep into sister!—he might have been in a position to touch a millionaire brother-in-law for the needful whenever he felt disposed, the iron entered into Nutty’s soul. A rotten, rotten world! Nutty had the sort of mind that moves in circles. After contemplating for a time the rottenness of the world, he came back to the point from which he had started. He kicked a small pebble that lay convenient to his foot. It became evident to Elizabeth that, until some explanation of this point was offered to him, Nutty would drift about in her vicinity, moaning and shuffling his feet indefinitely. The doubts which she was trying to crush increased the violence of their attack. It was not that she respected Nutty’s judgment in itself. It was that his view of what she had done chimed in so neatly with her own. She longed for someone to tell her that she had done right: someone who would bring back that feeling of certainty which she had had during her talk with Bill. And in these circumstances Nutty’s attitude had more weight than on its merits it deserved. She wished she could cry. She had a feeling that if she once did that the right outlook would come back to her. Nutty, meanwhile, had found another pebble and was kicking it sombrely. He was beginning to perceive something of the intricate and unfathomable workings of the feminine mind. He had always looked on Elizabeth as an ordinary good fellow, a girl whose mind worked in a more or less understandable way. She was not one of those hysterical women you read about in the works of the novelists; she was just a regular girl. And yet now, at the one moment of her life when everything depended on her acting sensibly, she had behaved in a way that made his head swim when he thought of it. What it amounted to was that you simply couldn’t understand women. Into this tangle of silent sorrow came a hooting automobile. It drew up at the gate and a man jumped out. The man who had alighted from the automobile was young and cheerful. He wore a flannel suit of a gay blue and a straw hat with a coloured ribbon, and he looked upon a world which, his manner seemed to indicate, had been constructed according to his own specifications through a single eyeglass. When he spoke it became plain that his nationality was English. Nutty regarded his beaming countenance with a lowering hostility. The indecency of anyone being cheerful at such a time struck him forcibly. He would have liked mankind to have preserved till further notice a hushed gloom. He glared at the young man. Elizabeth, such was her absorption in her thoughts, was not even aware of his presence till he spoke to her. She looked up and met that sunny eyeglass. “This is Flack’s,” she said. “Thank you,” said the young man. The automobile, a stout, silent man at the helm, throbbed in the nervous way automobiles have when standing still, suggesting somehow that it were best to talk quick, as they can give you only a few minutes before dashing on to keep some other appointment. Either this or a natural volatility lent a breezy rapidity to the visitor’s speech. He looked at Elizabeth across the gate, which it had not occurred to her to open, as if she were just what he had expected her to be and a delight to his eyes, and burst into speech. The name struck Elizabeth as familiar. But he had gone on to identify himself before she could place it in her mind. “Oh, yes,” said Elizabeth, and was about to invite him to pass the barrier, when he began to speak again. The young man seemed relieved. In spite of her identity, this was precisely what Elizabeth was doing. Her mind, still under a cloud, had been unable to understand one word of Mr. Nichols’s discourse. Judging from his appearance, which was that of a bewildered hosepipe or a snake whose brain is being momentarily overtaxed, Nutty was in the same difficulty. He had joined the group at the gate, abandoning the pebble which he had been kicking in the background, and was now leaning on the top bar, a picture of silent perplexity. With which manly admission the young man paused, and allowed the rays of his eyeglass to play upon Elizabeth in silence. Elizabeth tried to piece together what little she understood of his monologue. The eyebrow above the eyeglass rose, surprised. 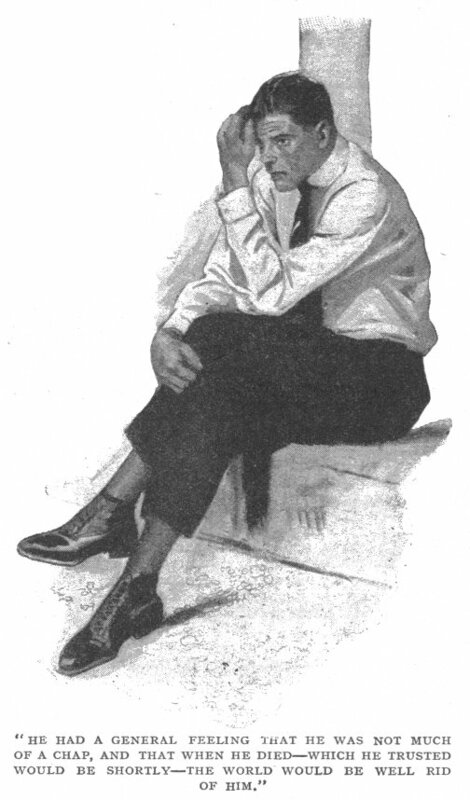 The young man made a despairing gesture. “I took it for granted that it had come on the same boat that I did. There you have the governor’s methods! Couldn’t want a better example. I suppose some legal formality or other has cropped up and laid him a stymie, and he’s waiting to get round it. You really mean he hasn’t written? For the first time Elizabeth found herself capable of smiling. She liked this incoherent young man. He looked from one to the other, apparently astonished at their slowness of understanding. Then an idea occurred to him. The dead silence in which his words were received stimulated him to further speech. It occurred to him that, after that letter of his, perhaps these people were wary about believing anything he said. “What’s the time?” said Elizabeth. Mr. Nichols was surprised. He could not detect the connection of ideas. “It’s about five to eleven,” he said, consulting his watch. “Take me to the station, at once,” she was crying to the stout, silent man, whom not even these surprising happenings had shaken from his attitude of well-fed detachment. The stout man, ceasing to be silent, became interrogative. The stout man was not a rapid thinker. He enveloped her in a stodgy gaze. It was only too plain to Elizabeth that he was a man who liked to digest one idea slowly before going on to absorb the next. Jerry Nichols had told him to drive to Flack’s. He had driven to Flack’s. Here he was at Flack’s. Now this young woman was telling him to drive to the station. It was a new idea, and he bent himself to the Fletcherizing of it. “I’ll give you ten dollars if you get me there by eleven,” shouted Elizabeth. The car started as if it were some living thing that had had a sharp instrument jabbed into it. Once or twice in his life it had happened to the stout man to encounter an idea which he could swallow at a gulp. This was one of them. Mr. Nichols, following the car with a wondering eye, found that Nutty was addressing him. “Is this really true?” said Nutty. A wild cry, a piercing whoop of pure joy, broke the summer stillness. Nutty seized him by the arm, hospitable though handicapped. Bill made his way along the swaying train to the smoking-car, which was almost empty. It had come upon him overwhelmingly that he needed tobacco. He was in the mood when a man must either smoke or give up altogether the struggle with Fate. He lit his pipe, and looked out of the window at Long Island racing past him. It was only a blur to him. The conductor was asking for tickets. Bill showed his mechanically, and the conductor passed on. Then he settled down once more to his thoughts. He could not think coherently yet. His walk to the station had been like a walk in a dream. He was conscious of a great, dull pain that weighed on his mind, smothering it. The trees and houses still moved past him in the same indistinguishable blur. He became aware that the conductor was standing beside him, saying something about a ticket. He produced his once more, but this did not seem to satisfy the conductor. To get rid of the man, who was becoming a nuisance, he gave him his whole attention, as far as that smothering weight would allow him to give his whole attention to anything, and found that the man was saying strange things. He thought that he could not have heard him correctly. Bill blinked. Either there was some mistake or trouble had turned his brain. He pushed himself together with a supreme effort. “But—but why?” demanded Bill, feebly. The conductor seemed unwilling to go into first causes. The conductor delved in his mind for adjectives. He desisted from his cataloguing at this point, for, with a loud exclamation, Bill had dashed away. Two cars farther back he had dropped into the seat by Elizabeth and was gurgling wordlessly. A massive lady, who had entered the train at East Moriches in company with three children and a cat in a basket, eyed him with a curiosity that she made no attempt to conceal. Two girls in a neighbouring seat leaned forward eagerly to hear all. This was because one of them had told the other that Elizabeth was Mary Pickford. Her companion was sceptical, but nevertheless obviously impressed. The massive lady told the three children sharply to look at their picture-book. The mother of three said that if her offspring did not go right along to the end of the car and look at the pretty trees trouble must infallibly ensue. At the sound of the name the two girls leaned back, taking no further interest in the proceedings. Elizabeth smiled, a shaky but encouraging smile. It was the indefatigable conductor, sensible of his duty to the company and resolved that nothing should stand in the way of its performance. Bill gave him five dollars and told him to keep the change. The conductor saw eye to eye with him in this. A look of the utmost determination overspread Bill’s face. The stout lady ceased to listen. They had lowered their voices and she was hard of hearing. 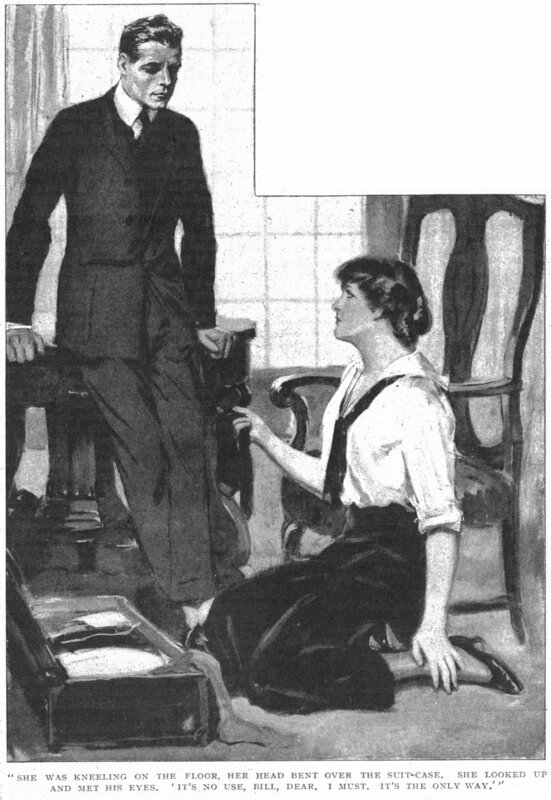 She consoled herself by taking up her copy of Gingery Stories and burying herself in the hectic adventures of a young millionaire and an artist’s model. Elizabeth caught a fleeting glimpse of the cover. 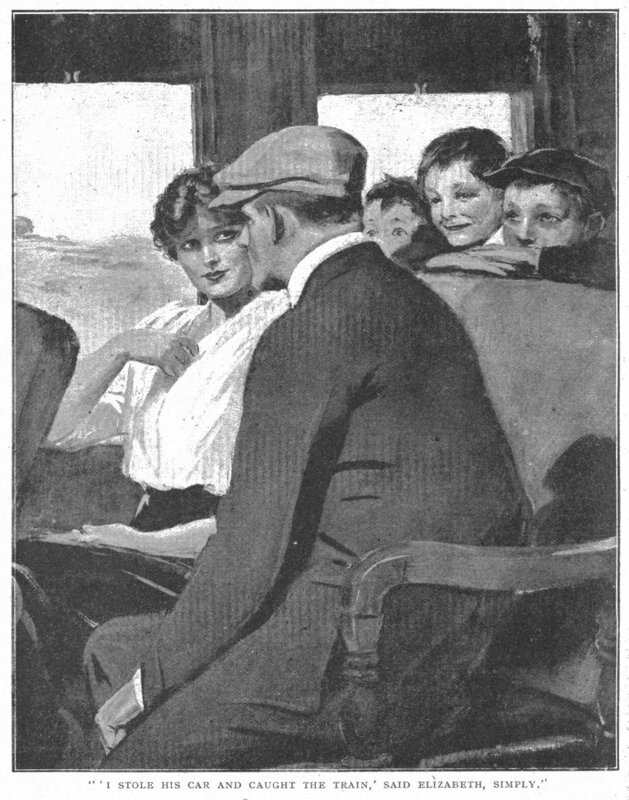 “So I stole his car and caught the train,” said Elizabeth, simply. Bill was recovering slowly from the news. “But—this makes rather a difference, you know,” he said. Elizabeth tapped him on the knee. “It’s a pin. And I’m going to dig it right into you wherever I think it will hurt most, unless you stop being Harold at once. I’ll tell you exactly what you’ve got to do, and you needn’t think you’re going to do anything else. When we get to New York, I first borrow the money from you to buy a hat, and then we walk to the City Hall, where you go to the window marked ‘Marriage Licences,’ and buy one. It will cost you one dollar. You will give your correct name and age and you will hear mine. It will come as a shock to you to know that my second name is something awful! I’ve kept it concealed all my life. After we’ve done that we shall go to the only church that anybody could possibly be married in. It’s on Twenty-ninth Street, just round the corner from Fifth Avenue. It’s got a fountain playing in front of it, and it’s a little bit of heaven dumped right down in the middle of New York. And after that—well, we might start looking about for that farm we’ve talked of. We can get a good farm for a million, and leave something over to be doled out—cautiously—to Nutty. Something small and soft slipped itself into his hand, just as it had done ages and ages ago in Lady Wetherby’s wood. It stimulated Bill’s conscience to one last remonstrance. He broke off, as a sharp pain manifested itself in the fleshy part of his leg. Elizabeth was looking at him reprovingly, her weapon poised for another onslaught. “I told you!” she said.